Lyte Now is a full spectrum electrolyte paste designed to help replenish major electrolytes and trace minerals lost in sweat by hard working horses. Supports proper mineral balance to maintain the circulation of vital body fluids and the transmission of nerve impulses pre- or post-event for an optimal competitive edge. Sold online in multiples of 3. Best administered after the horse has consumed water. 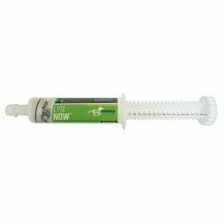 An easily digestible and absorbable paste administered post-event, Lyte Now supports healthy electrolyte hydration and crucial electrolyte balance to keep your horse performing at its best. - Helpful for hydration, energy production, acid base balance, heart and lung function, and stress recovery. - Support for mineral balance, to maintain the balance and flow of vital body fluids, the transmission of nerve impulses, and the healthy function of muscles and the circulatory system. - Electrolyte minerals Sodium, Chloride, Potassium, Calcium, Phosphorous and Magnesium. - Glycine and Taurine,amino acids that further support electrolyte bioavailability, utilization and detoxification. - Herbal extract DGL (Deglycyrrhized Licorice) to support healthy gut function. - Trace minerals Copper, Zinc, Iron, Manganese and Cobalt to support healthy red blood cell and hemoglobin production, as well as adaptation to the increased oxidative stress associated with strenuous activities or events.